RemoteCommand manager is a GUI-based tool that enables you to perform common system administration tasks by executing remote commands on other PCs. Tool has a fast and easy to use interface that supports saving a profiles and command presets. No need to use any console tools. All commands may be run in multithreaded mode. It allows you to execute various actions on remote machines. Tool does not require to install client part on the remote PCs. Remote command execution tool designed for system administration and automation. Remote Command Manager supports versions of Windows 2000 and above, including Server 2003-2008; Does not require to install client part on the remote PCs. Lets you remotely manage over a network: tasks, processes, services and events. IRCommand2 - IR remote control software for the PC - now with X10 support! 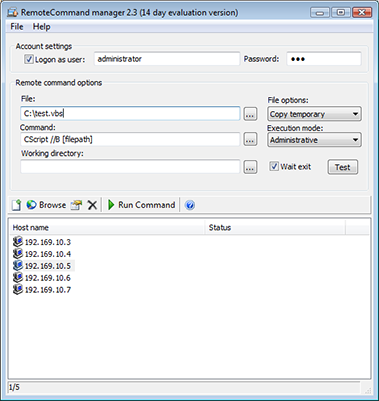 Softabar Command Line Password Manager. Manage your passwords in command line. Qweas is providing links to Remote Command Manager 2.5 as a courtesy, and makes no representations regarding Remote Command Manager or any other applications or any information related thereto. Any questions, complaints or claims regarding this application Remote Command Manager 2.5 must be directed to the appropriate software vendor. You may click the publisher link of Remote Command Manager on the top of this page to get more details about the vendor.